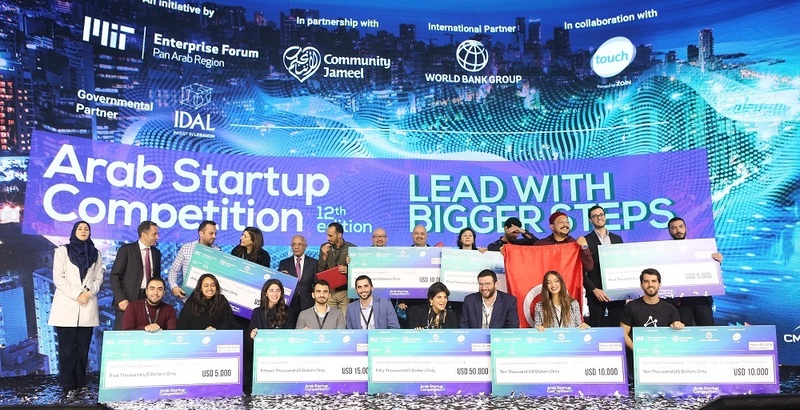 MIT Enterprise Forum Pan Arab announced the winners of 12th edition of Arab Startup Competition in a conference and award ceremony held in Beirut last month. The competition that is divided into three main categories; startup track, ideas track, and social entrepreneurship track, selected and announced a winner and two runners up for each of three tracks. The nine winners and runners-up of the competition were selected from hundreds of applicants. 65 startups had made it to the semi-finals who went through a two-day bootcamp in Jordan before they pitched their startups, ideas and social enterprises in front of judges in Beirut, where the conference and award ceremony took place. 29 of these went to the finals and pitched again in front of a different judging committee — that selected three winners and runners-up for each of the three tracks. Mashvisor, a San Francisco-based startup with teams in United States and Palestine, has built an online platform that enables real estate investor quickly find and analyze potential traditional and Airbnb investment properties in the United States. The platform aggregates different type of real estate data to make real estate investments and rental strategy decisions easy for investors. Mashvisor provides neighborhood data and analytics that includes Cash Flow, Cash on Cash Return, Cap Rate, GRM, Vacancy Rates and rental market strength indicators. The startup claims that the research process that usually takes three months to find decent investment opportunities in real estate can be completed in 15 minutes using its platform. Mashvisor won $50,000 as prize money being awarded as a winner of the startup track. Repzo is a mobile CRM that enables employers to track and monitor field employees such as sales executives, merchandisers, truck drivers, medical reps. The solution allows employees to enter all their geo-tagged activities, enabling managers to keep a track of them from a computer, smartphone or tablet. The managers can monitor their shelves with instant photo uploads by the employees, monitor how much time an employee is spending with each client, receive purchase orders and survey instantly, and even collect and analyze data ussing Repzo’s dynamic forms. The startup won $10,000 as prize money. Furnwish empowers furniture retailers and design professional to better showcase their products to the customers, in an engaging experience. The startup has built tools and solutions that use Augmented Reality (AR) and artificial intelligence that enable customers to visualize every product in accurate measurements & insightful recommendations. So if you’re buying from a retailer that’s using Furnwish’s solution, you should be able to visualize how a chair, sofa, or desk you want to buy will look like in that empty corner of your living room. Frunwish received $5,000 as prize money. Quadra provides affordable optical fruit sorting machines, enabling their customers to sort fruits at international standards. The existing methods, which include manual labor and traditional sorting machines, are either inefficient or expensive. Quadra offers a cheaper, better alternative, as its services can be rented by farmers, making sorting machines financially accessible to all types of farmers. Their optical sorting machine, according to the startup, can sort at international standards by size, color, and quality. Quadra was rewarded with $15,000 as prize money. Addenda is an insurance technology startup that uses distributed ledger technology (DLT) to streamline processes and share data between insurance companies. According to their website, their product could be used by health insurance companies to track and log insurance claims in real-time as they’re filed in hospitals, life insurance companies who can screen the applicants, and motor insurers who can streamline and automate the recovery. Addenda went home with $10,000 of cash. Dloc Biosystems is a drug discovery platform that allows scientists to understand how diseases, like cancer, develop inside the human body without having to adopt trial-and-error to measure the efficacy of each treatment. Their device programs human cells to behave as they would do inside the human body, so drugs are tested on the device before testing on live patients. The technology, according to the startup, allows scientists to run vitro experiments in ‘3D circular channels’, which morphologically resemble live human tissues and organs. In traditional drug discovery devices, experiments are conducted in 2D flat sheets (Petri dishes). DLOCplate allows cells to adhere, grow and reorganize themselves to form 3D circular channels. Dloc Biosystems won $5,000 for being selected as the second runner-up. Compost Baladi promotes local recycling of solid & liquid bio-wastes in households, restaurants, academic institutions, commercial establishments, municipalities, non-profit organizations and refugee camps/settlements by providing different products and services that are in-line with the on-going national waste management crisis. The social enterprise aims to promote local recovery of valuable resources from bio-waste. Compost Baladi received $50,000 as prize money for being winning the social entrepreneurship track. Ahmini connects women from rural areas with insurance companies to provide them access to access to social security and financial coverage. The startup that acts as the middle man between two parties has its ambassadors collect the data needed on prospective women who then facilitate the process of transferring the policy fees by installments through an electronic payment system. Ahmini also finds individuals or companies who are willing to cover those expenses. CanBank is a machine that allows users to exchange their used beverage cans or plastic bottles with phone credit, discounts on different services, or charity. The machine can be placed in schools, universities, or supermarkets with customized rewards to encourage recycling. The machine is developed by ZeroPrime Technologies, an Egyptian startup that develops smart sustainable cities infrastructure. CanBank was rewarded with $5,000 as prize money.